32 Fujikura Kasei Co. Ltd. Global Intumescent Coatings Market size is slated to reach USD 1 billion by 2024; as per a new research report by Global Market Insights, Inc. Strong growth indicators in the construction industry is analyzed to be the prime factor propelling the global intumescent coatings market size by 2024. These coatings are extensively used in the civil structures due to swelling characteristics on contact with high temperature, where product volume increases and density subsides. This product characteristic makes it appropriate for fireproofing applications in the construction business. In 2015, the overall construction expenditure across the globe was roughly around USD 7 and is likely to surpass 13 trillion by 2024. Offshore petrochemical, chemical and steel are prominent industries where product is widely used for fire protection, as environment in these sectors are potently exposed to heat. Increasing fire protection and safety requirement across these industry sectors will significantly boost the product demand across the globe. Furthermore, the global oil & gas consumed in 2015 was 550 quadrillion units, up from around 450 quadrillion units in 2005. This elevation will substantially boost the product demand. Additionally, upcoming shale gas industry in China, Russia and the U.S. will further complement the intumescent coatings market size. 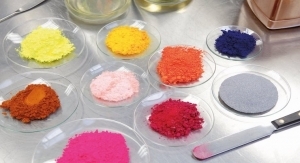 Graphite, sodium silicate and epoxy resins are primary raw materials in the intumescent coatings market share, bottleneck supply dynamics of raw materials in the industry owing to high demand across other industries including construction and automotive may obstruct business growth. 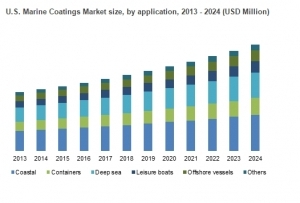 Water based intumescent coatings market is forecast to witness highest growth by 2024, particularly due to its ecofriendly characteristics. Favoring government regulations for the technology on account of low VOC levels will fuel the demand over the projected period. The solvent based intumescent coatings market size was over USD 110 million in 2015. The industry shall observe modest gains by 2024 due to due to stringent environmental norms. Cellulosic intumescent coatings market size will see growth of around 4.5% over the projected timeframe. Increasing demand in the construction business shall drive growth by 2024. Hydrocarbon intumescent coatings market share is likely to witness maximum growth in the coming years. These are extensively used in the petrochemical and energy sector, where fire protection and insulation is essentially required. The overall industry revenue from oil & gas applications was approximately USD 400 million in 2015. Increasing product requirement in the business for fireproofing and fire protection applications due to prevalence of fire safety norms will substantially elevate the product demand by 2024. In 2015, the North American industry was close USD 150 million. The regional industry is primarily driven by strong oil and gas industry, and shale gas exploration. The global intumescent coatings market size was led by Asia Pacific in 2015. Robust construction industry growth in China and India is the major factor driving regional growth. In 2015, the intumescent coatings market was comprised of six major industry players contributing more 50% of the global share. Key companies include 3M, Sherwin-Williams, Carboline, Albi Manufacturing, AkzoNobel, PPG Industries Inc., Hempel Rudolf Hensel, Null Fire, Flame Control, Contego International, Jotun, Albi Manufacturing, Leighs Paints and Crown Paints.